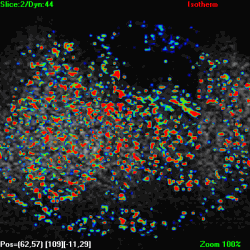 To take advantage of the major benefits MR provides in the control of thermal ablations, the focused ultrasound device has to be specifically designed for compatibility with the MR environment. 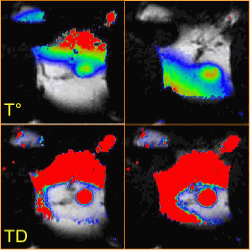 sensitivity of MR imaging to radio frequency interferences. sensitivity to para or ferro magnetic materials in the vicinity of the MR magnet. the limited space available for the device and the patient in the magnet bore. MR is extremely sensitive to radio frequency signals. Any electronic device used within the Faraday cage of the MR tend to produce RF interferences also called spikes [picture left of an MR image spoiled by RF artifacts]. Extreme care must be taken in the design, especially in the case of a powerful device like the 768W phased array generator developed for TargetedFUS, to avoid any RF noise in the frequency range of MR signal acquisition. 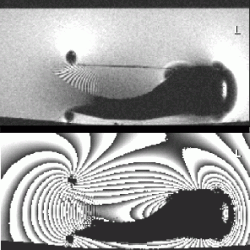 The transducer and its positioning system must be build exclusively from non magnetic materials [picture left shows MR modulus and phase images with various artifacts due to the presence of paramagnetic material in the transducer]. This exclude for instance the use of standard electrical motors and of most commonly used metals. Available space in the magnet bore is very limited as the diameter of common 1.5T and 3T MR magnets is 60cm. 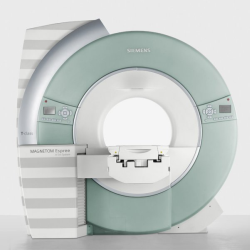 Siemens with its ESPREE system [picture left] does provide more patient room with a 70cm bore.